Notts County have sacked manager Steve Thompson after a run of three defeats, having taken just 11 points from their first 11 League Two games this season. A club statement revealed that his contract had been terminated with immediate effect. Thompson's former assistant John Gannon will be in caretaker charge against local rivals Mansfield on Saturday. "We have taken the action we believe is necessary to rectify the situation," chairman John Armstrong-Holmes said. "I want to thank Steve for assembling what I believe is the best squad of players we have had at County for six or seven season. "Although it's clear that the fans have perhaps not taken to him in the way they did with some of his predecessors, it is without question that he worked extremely hard to make this team successful. "It's sad and unfortunate that we haven't been collecting the points on the pitch that we expected, but we are in a results-orientated business." Thompson had previously managed Lincoln City, Southend United and Cambridge United, while he also had a spell as caretaker boss of Sheffield United - and also served Notts County as assistant manager to Colin Murphy between 1995 and 1996. 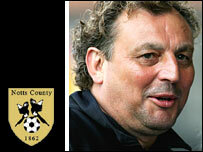 He was appointed as Meadow Lane manager in the summer of 2006 on a three-year contract, succeeding Gudjon Thordarson as boss. Despite only finishing 13th in League Two last season, he and Gannon were given one-year contract extensions in May, tying them to Meadow Lane until the summer of 2010. But after relieving Thompson of his duties, the club are now looking for their eighth manager in just over six years. Not since Neil Warnock took the Magpies into the top flight in 1991 has anyone stayed in the job for two full seasons.